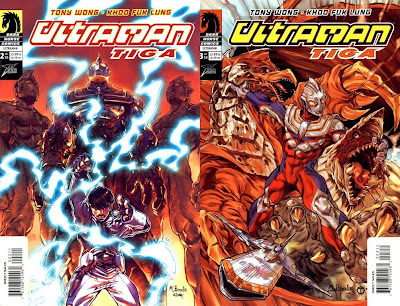 Unknown to most of us, Dark Horse comics released a manga adaptation of one of the most popular Ultraman series in the 90's, ULTRAMAN TIGA. This was originally released during 2003-2004, seven years after the show's original run. 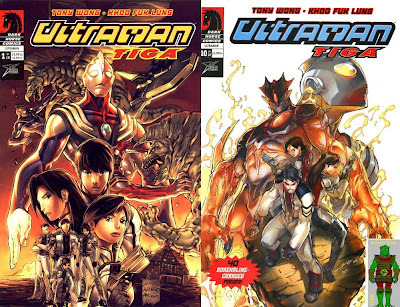 The Ultraman Tiga manga adaptation is a 10-chapter manga series originally published in Hong Kong last 2003. This is written by Tony Wong and illustrated by Khoo Fuk Lung. Set in the year 2049, after experiencing peace through many years, the Earth and Global Unlimited Task Squad (GUTS) faces various monster attacks. With this, an ancient being emerges to protect Earth. And he is called ULTRAMAN TIGA! For those who are interested on buying there's own copies of ULTRAMAN TIGA manga, please check out Dark Horse Comic's official website for item availability. Each chapter (10 total) is available for US$3.99 and each compilation volume (2 total) costs $US$19.99 each. Special thanks to the original scanner and Gideon for finding the scans.